Edwin Lutyen was a British architect who built parts of New Delhi in the 1920s. This part of Delhi hosts the official residence of the President, India Gate (a large arch dedicated to those who died during World War II) and various other structures which now are an integral part of not only Delhi, but the country was well. The Delhi of Edwin Lutyen is a mere 15-minute drive. It hosts the Rashtapati Bhavan (the official residence of the President), India Gate, the Parliament house, the National Museum (which houses artifacts from the 5,000 year old Indus Valey Civilization) and some administrative buildings. The central avenue of this part of Delhi connects Rashtrapati Bhavan on it's west end to India Gate on it's east end. This red stone building, topped by a copper dome is perched on the top of Raisina Hill. Previously the home of the British Viceroy it is now the official residence of the President of India (Rashtrapati in Hindi). 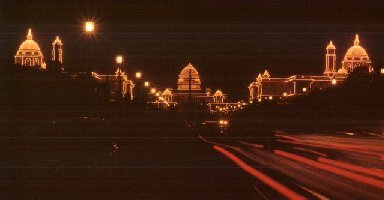 It also houses the offices of various administrative departments in two sections of the complex called 'North Block' and 'South Block' On days of national import, such as Independence Day (August 15), the Bhavan is decorated with lights. 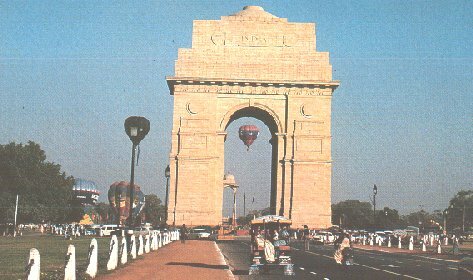 India Gate was built to immortalize the 85,000 soldiers who died in World War II. It houses the Amar Javan Jyoti, the fire of immortal soldiers. 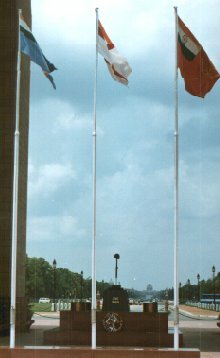 The Amar Jawan Jyoti is guarded by the flags of the Indian army, navy and air-force. The structure is made of black marble and has four perpetually lit fires at its four corners. The small structure at the centre has "Amar Jawan Jyoti" inscribed on it (in Hindi) and a rifle topped with the army hat (used during World War II) emerging from it. 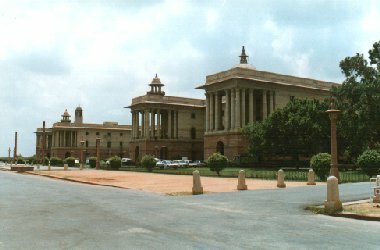 The Indian Parliament is divided into two houses - the upper house is known as the Rajya Sabha and the lower house is known as the Lok Sabha. The Lok Sabha has 550 seats. 530 members are representatives of the Indian states and 20 members represent Union Territories (territories governed by the Central (Federal) government). The Rajya Sabha has 250 members, 238 of which represent states and Union Territories and the 12 nominated members are nominated on the basis of eminence in the fields of arts, sciences, literature etc. The Parliament is basically a round building. It is located near Rashtrapati Bhavan, and can be seen from Rajpath.